As temperatures continue to rise well into the hundreds here in Phoenix, my interest in refreshing easy breakfast recipes and easy fruit recipes and easy summer recipes is increasing too. I’m still enjoying the muesli recipes very much. The trick is remembering to assemble the muesli before bed, something that hasn’t become a habit yet. Mornings I realize I forgot to stir together my oats, yogurt, fruit and nuts, I often turn to another of those quick easy breakfast recipes that is especially perfect for summer: magical yogurt breakfast cream. Breakfast Smoothies are another delicious way to get your day started on a healthy note and I’ve always been a fan of cottage cheese since it can be enjoyed in so many ways and a great breakfast cookie recipe can be fun from time to time. Sometimes I want something a little more substantial than a healthy smoothie and I’m out of cottage cheese. What then? 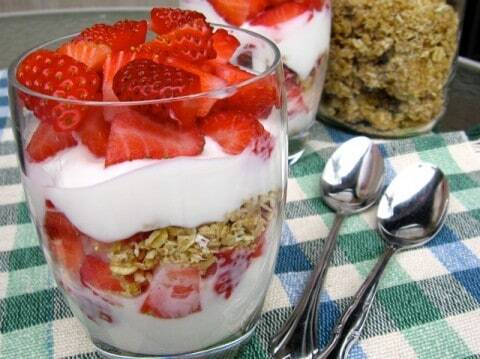 How about a breakfast fruit parfait? With a variety of tasty fruits widely available and my love of yogurt, nuts, flax, and crunchy cereal, a layered parfait seems like another easy breakfast recipes winner for summer. When assembling my morning breakfast parfait I choose whatever seasonal fruit is ripe and appealing. I’ve been using mostly Greek-style yogurt too. I love its rich creamy texture, but feel free to choose whatever form of plain yogurt you like best. Of course, you can opt for a pre-sweetened fruit flavored yogurt, but the amount of sugar and calories you are consuming will increase significantly. My favorite crunchy cereals include homemade granola and Grape-nuts and with nuts, I usually reach for almonds or walnuts for their omega-3 boost. Spoon half of the fruit into a glass or bowl. Spoon half the yogurt on top and drizzle with half your sweetener. Sprinkle with half of your selected crunch toppings and then repeat the layers. Serve immediately. This easy breakfast fruit parfait recipe makes one delicious serving. The nutritional estimates and Weight Watchers PointsPlus value will vary depending on what kind of yogurt, fruit and topping you use. Most that I’ve calculated have between 4 and 6 PointsPlus values.